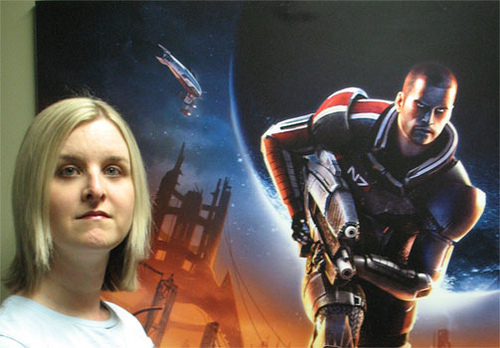 Christina Norman worked for BioWare on the Mass Effect series. She's apparently with with a company I've never heard of these days..
"There's no point in releasing DLC a year after your game has come out when most people have already sold your game back to GameStop three times"
"That means getting it out early; that means even day-one DLC. That is a terrible thing to some players. Oh woah is me lady. let's be frank, it's all about the money. Plain and simple. Norman also said "We just want to release awesome stuff. Players please, give us a chance. Judge our games based on what they are. Judge the DLC based on what it is. Stop thinking you're a producer and telling us when and where we should be building our content." I think she still misses the point. Forget arguments about quality (as a lot of DLC is sub par) if it DLC wasn't an opportunity to extract some economic rent from the players, it simply wouldn't happen. You could make the argument I guess that some DLC could never have been incorporated into the game in the first place. Take Gears of War 3 - there was no place in that brilliant campaign to add in the clever Raam's Shadow DLC. As for Norman's rant at fans, that's a really bad way to encourage and foster a fan base? Do you ever seem Bungie or Frankie from 343 Industries mouthing off about fans publically? I didn't think so either.